2001’s Ocean’s Eleven was a slight but breezy and enjoyable heist caper. Its two superfluous sequels were aimless, self-indulgent add-ons that felt more like thin excuses for the star-studded cast to get back together and have some more fun. And now, as if the “brand name” has not been milked to death, here comes a paper-thin indirect “sequel” of sorts. Ocean’s Eight is a generic and uninspired heist caper that’s never more than mildly entertaining and doesn’t offer anything fresh besides its all-female cast. The titular “Ocean” here is not George Clooney’s Danny (who’s supposedly dead, although the movie oddly dangles ambiguity without clearing it up one way or another), but his never-before-mentioned sister Debbie (Sandra Bullock), who like her brother at the beginning of the original film, is being let out on parole. And also like her sibling, the “reformed” Debbie wastes no time putting together a crew for her next big score, including reuniting with ex-partners Lou (Cate Blanchett) and Tammy (Sarah Paulson), and finding newbies, including pickpocket Constance (Awkwafina), hacker Eight Ball (Rihanna), jewelry designer Amita (Mindy Kaling), and cash-strapped fashion designer Rose (Helena Bonham Carter). The target: the star-studded Met Gala, specifically a $150 million necklace that has to be snatched off the neck of movie star Daphne Kluger (Anne Hathaway). Most heist movies spend significant screentime on the complex preparations for the caper, and then the climax showing how it all goes down. In a good entry in this genre, the details can be fascinating, the heist suspenseful, the quirky gang of thieves entertaining. Ocean’s Eight follows the basic formula but comes up underwhelming on all counts. Director Gary Ross lacks the flair Steven Soderbergh brought to Ocean’s Eleven, and the uninspired, by the numbers feel permeates the production. The heist is not engaging (even the lightweight breeze Ocean’s Eleven had more tension than this), and a couple “twists” aren’t surprising. Despite all the glamorous wardrobes and jewelry on display, there’s no sense of style. There’s also some plot elements that feel oddly half-formed. The movie seems to set us up to expect a surprise George Clooney cameo, and then never follows through on it, a surefire recipe for disappointment (don’t bother staying through the end credits, there’s nothing there either). The only “series veterans” to make cameos are Elliott Gould and Shaobo Qin (not exactly “spare no expense”). 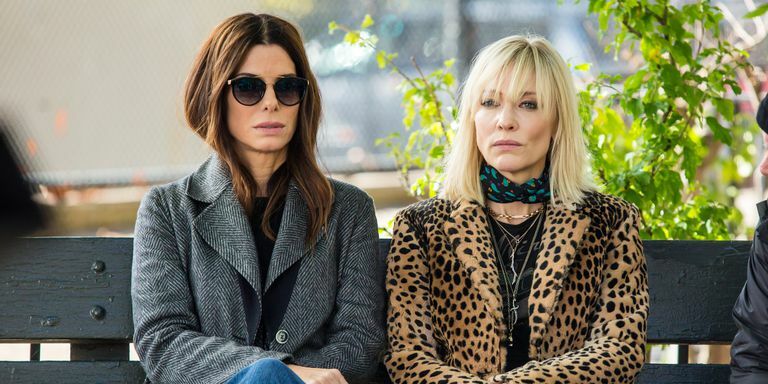 There also seems to be a curious ambiguous undertone of flirtatious sexual tension between Sandra Bullock and Cate Blanchett’s characters that goes unacknowledged. Our “villain”, Debbie’s sleazy ex (Richard Armitage) is too underused for his comeuppance to be worth caring about, and James Corden pops up in the eleventh hour as a Columbo-esque investigator who is mildly amusing but feels rather pointless. Ocean’s Eight takes a little too much time to wrap itself up after the heist is over. Despite being the lead, one could argue Sandra Bullock is the blandest member of the ensemble. Bullock is adequate, but she lacks either George Clooney’s screen presence or a femme fatale quality that could have given Debbie a little more juice. Cate Blanchett shows more charisma (and gets to rock a series of stylish outfits), enough to draw more attention than Bullock when they share the screen, although her accent can’t seem to make up its mind whether it’s Australian or American. Anne Hathaway seems to be enjoying herself sinking her teeth into a caricature of a vapid movie star who turns out to not be as dumb as she seems. 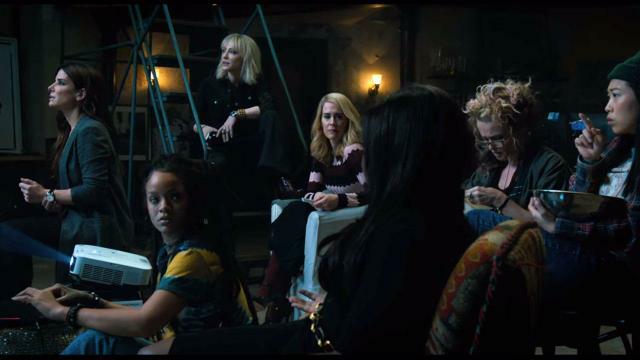 Helena Bonham Carter is her usual wild-haired, eccentric self (plus Irish accent), while Sarah Paulson, Mindy Kaling, Awkwafina, and an almost unrecognizable, deglamorized Rihanna fill out the “quirky” supporting crew. There’s various celebrity cameos scattered around (most of them playing themselves), including but not limited to Common, Dakota Fanning, Katie Holmes, Serena Williams, Kim Kardashian, Heidi Klum, Marlo Thomas, and Dana Ivey. Ocean’s Eight‘s inferiority to Ocean’s Eleven is telling of how important intangibles like style, flair, and panache can be. Both are fluff, but one is breezy, slickly enjoyable fluff, while one is just “meh”. Alas for those venturing to the theater in 2018, the latter describes Ocean’s Eight.